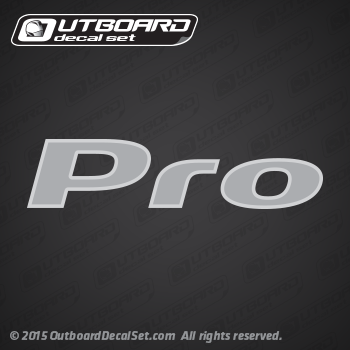 Mercury Pro rear decal for 2013-2015 Outboards. Seen on Optimax ProXS motors and new PROXS 150 hp, 175hp, 200 hp, 225hp and 250hp Cowlings. Size: 4 ⅝ long by 1 ⅛ tall size. No domed decals - this is a flat decal replica. Approx Size: 4 ⅝ long by 1 ⅛ tall size.